Home » News and Views » Reiterate buy Concurrent Technologies #CNC says VectorVest. Significant growth potential as fundamentals continue to improve. Reiterate buy Concurrent Technologies #CNC says VectorVest. Significant growth potential as fundamentals continue to improve. By Harry Dacres-Dixon in News and Views, VectorVest on 7th November 2018 . Colchester-based Concurrent Technologies Plc (CNC.L) develops and manufactures high-end embedded computer products for use in a wide range of high performance applications within the telecommunications, defence, security, telemetry, scientific and aerospace markets. Using mainly Intel® processors, including the latest generation Intel® Core™ i7 processors, Intel® Xeon® and Intel® Atom™ processors, the Company offers a wide range of computer products which are designed to be compliant with industry specifications including those for products used in extremely harsh environments. Other processors now include NVIDIA® Tegra® K1 devices. On September 12th 2018, CNC published interim results for the six months to 30 June 2018. Turnover rose slightly to £7.9m (H1 2017: £7.8m), PBT fell slightly to £1.1m (H1 2017: £1.4m) and EPS fell to 1.50 pence (H1 2017: 1.84 pence). The Company reported a cash balance (including cash deposits) at 30 June 2018 of £7.8m (H1 2017: £7.9m), and raised the interim dividend to 0.95p per share (H1 2017: 0.90p). CNC said its global customer base continues to expand with exports generating 88% of Group revenues (H1 2017: 84%), while Chairman Michael Collins said CNC’s specialised product ranges, processes and excellent customer relationships “all demonstrate that Concurrent Technologies is well placed for the future.” Separately, on October 8th 2018, CNC launched a new CompactPCI product featuring the latest 8th generation Intel® processor and designed to support existing customer base with enhanced security features. 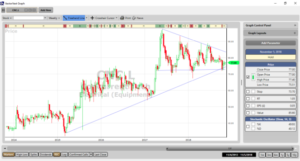 VectorVest published an article on CNC in April 2018 (read here), where we noted that the nascent value within the company triggered an RV (Relative Value) charting move in December 2017, which has continued to build during Q1 2018 on the back of multiple product launches. RV is an indicator of long-term price appreciation potential where CNC still scores 1.19, which is good on a scale of 0.00 to 2.00. CNC also scores very good GRT (Earnings Growth Rate) of 19%, and while the RS (Relative Safety) metric only registers a fair rating of 0.87 (scale of 0.00 to 2.00), trading at 77p the stock still offers some upside against the current VectorVest valuation of 86p per share. A weekly chart of CNC.L is shown above over a period of 5 years. Over this period the share price has made a series of rising lows where previous resistance has become support. Over the last few weeks the share price pulled back to the last old high made in 2016 and to important long-term support shown by the upsloping trend line on the chart. The share is currently on a hold recommendation on VectorVest. When this changes to a Buy, traders should carefully consider the opportunity. The technical target from classic charting techniques is over 100p. We noted in our April note that CNC offered significant growth potential, following a raft of product launches during Q1 and an increase in FY dividend. While the group has delivered a relatively indifferent first half, comments from the Chairman, a further increase in the interim dividend and the recent new product launch indicate that there is more to come from this niche computer product manufacturer. We reiterate our view that CNC is a company in steady rather than spectacular growth mode, but nonetheless still offers significant growth potential. Readers can examine trading opportunities on IGAS and a host of other similar stocks for a single payment of £5.95. This gives access to the VectorVest Risk Free 30-day trial, where members enjoy unlimited access to VectorVest UK & U.S., plus VectorVest University for on-demand strategies and training. Link here to view.